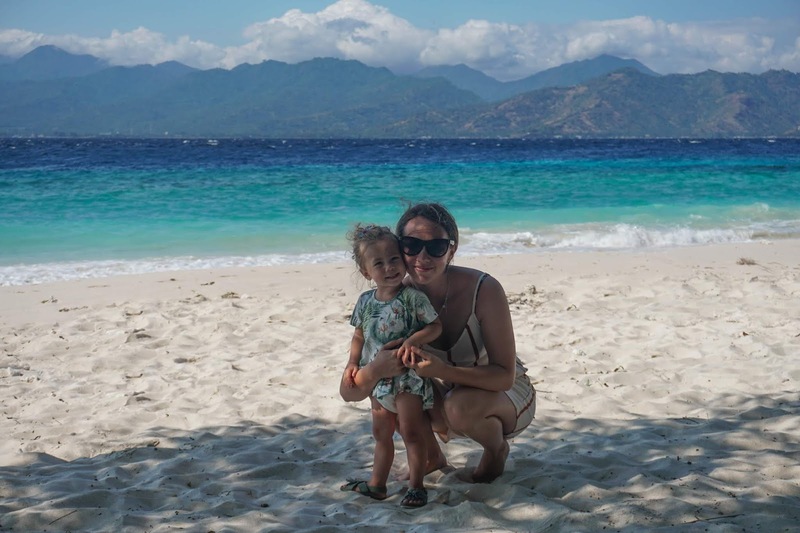 There is something magical about the Gili Islands. Every now and then we have places that we instantly feel a connection to. Gili Meno was like that for us. We even started looking at land for sale! One can dream right 😊We have decided to add a new feature to our posts-Five things the photos do not show...We like to share our favorite photos and stories, but we have come to learn that often some of our challenges or unexpected happenings can be just as helpful for others. Snorkelling with turtles, we hired a private boat with a glass bottom and went out early in the morning. Riki had seen turtles before in the red sea but it was the girl's first time. We were very excited. There were so many! Lilah loved to look through the glass bottom at all of the colorful fish. Eating dinner at Mahamaya and watching the sunset. You need to book if you want to reserve a spot on the beach. Swimming at the beach on Gili Meno. The water was warm and it was perfect for Lilah to wade in and play. Finding a bean bag or sun chair and relaxing around the islands. There are many places where you can go and be the only ones around or with very few people. 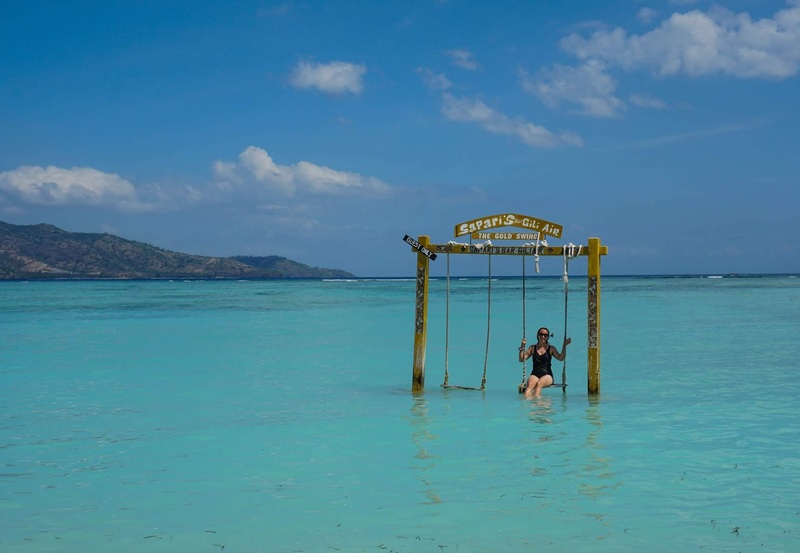 Exploring Gili Air made for a fun day. 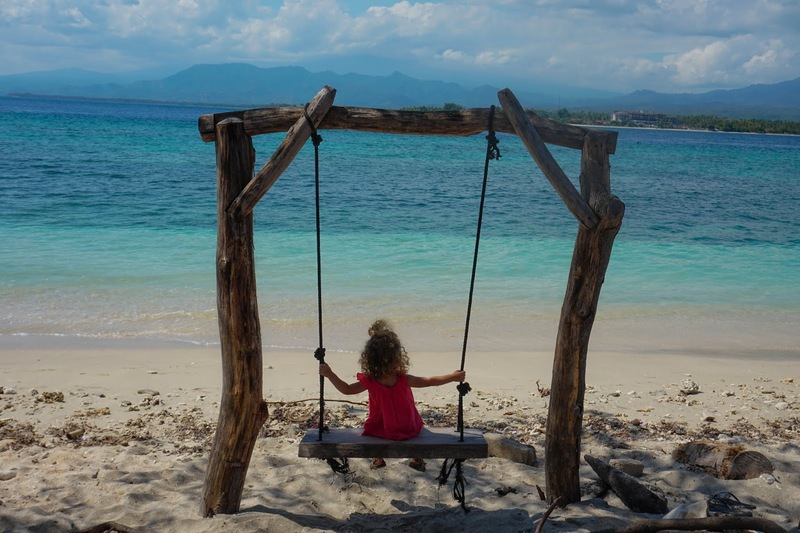 There were also many more swings on Gili Air which Lilah loved! 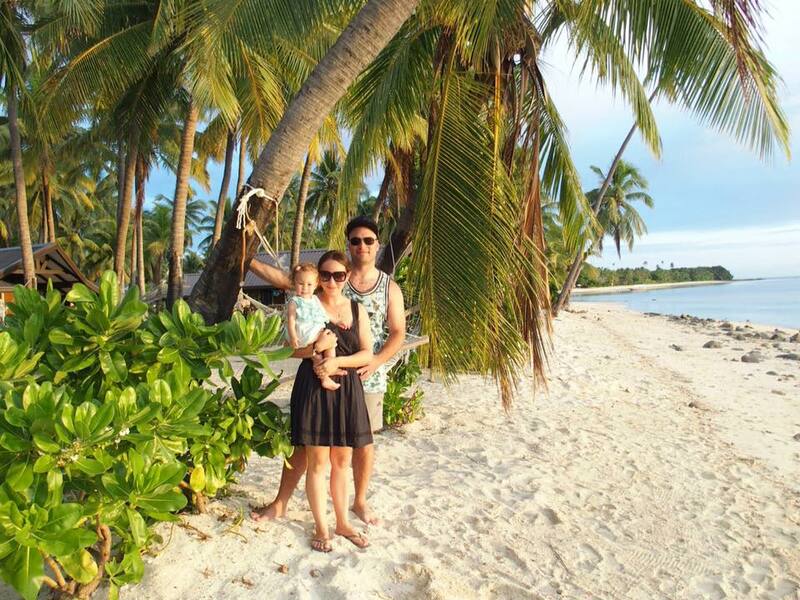 We stayed at Tropical Hideaways Resort and liked the location near the nicest beach. It had a pool and was a cute boutique place. There are many accomodation options on the islands. Make sure to just bike around and get a bit lost. 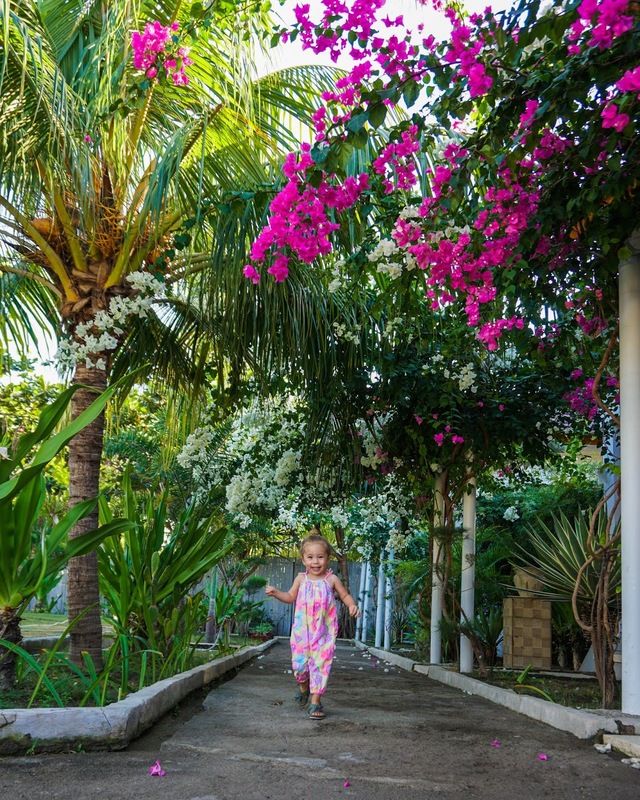 At times there's no one around and then you come across a local village area where it's easy to forget that there's actually resorts on the island. We were staying in Ubud before going to the Gilis and had booked our accomodation for Canggu after the Gilis. We are still learning to pack light so we asked our hosts if we could pay to have some of our luggage picked up and waiting for us in Canggu. We are so happy we did because it would have been a bit annoying lugging her carseat and extras on and off the boats. We also would not want to put it all on the horses! 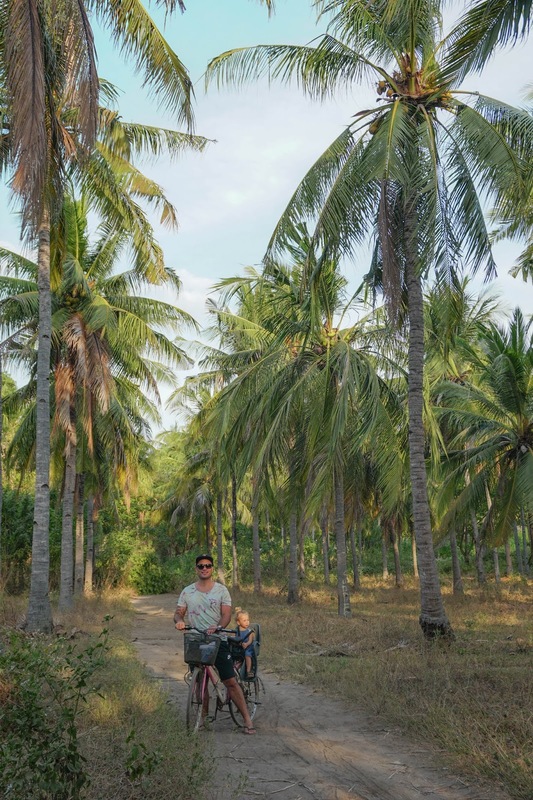 (There are no motorized vehicles on the islands). We decided to book our fast boat with Patagonia Express as it is the biggest boat and also new. We were pleased with the professionalism and safety. We decided to travel to and from the nearest port (Padang Bai) to reduce the time on the boat. The ride can be rough at times crossing the straight. Thankfully our journey was fine, apart from feeling a little sea sick at the end of our inbound trip. Patagonia Express did not go to Gili Meno so we had to catch a separate boat, which leave on the hour. It was very easy to deal with the company and book using WhatsApp. The snorkelling is good around Gili Meno. 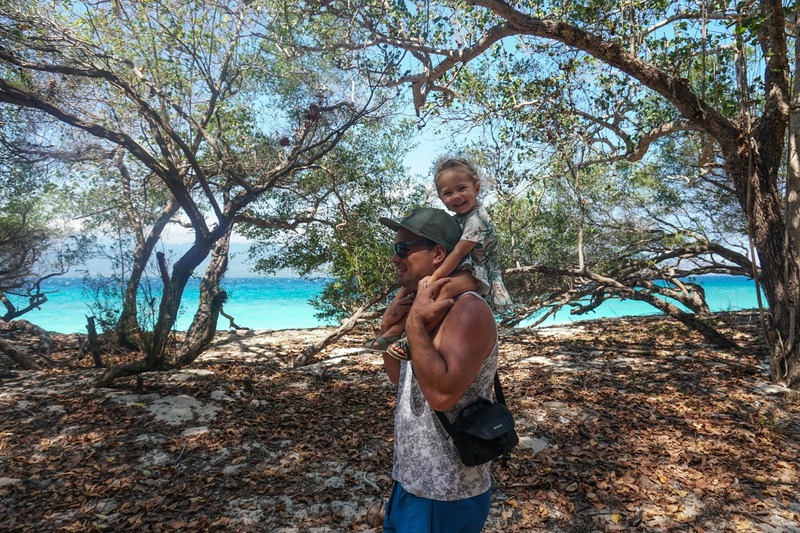 The private boat tour meant we were easily able to get to the area where the turtles are and around to the west side of the island where the best coral is. We ate at Mahamaya every night! We have never done this before. 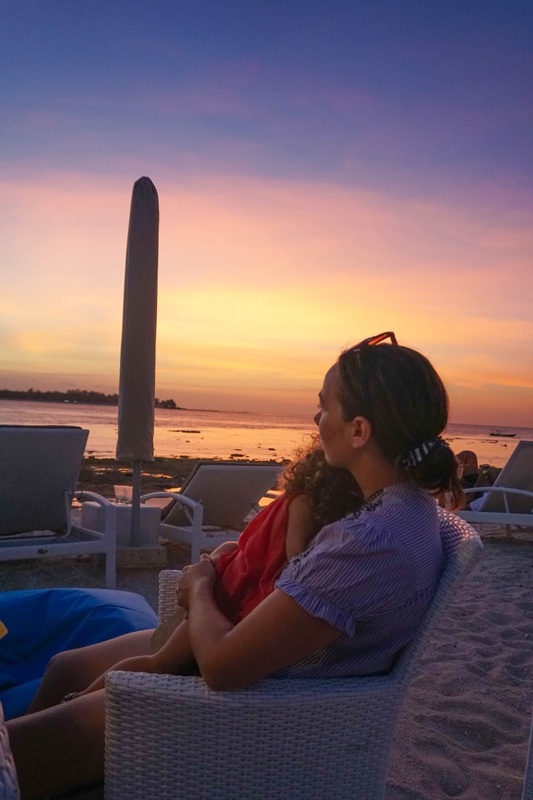 The setting on the beach with a sunset view and amazing food is hard to beat. The white chocolate Creme Brulee was Riki's favorite dessert ever! The lava cake at Mallias was also delicious. We often ate here as it was near the top beach there. Sasak cafe was a nice area to relax at in the evening. The band they had one night was amazing. 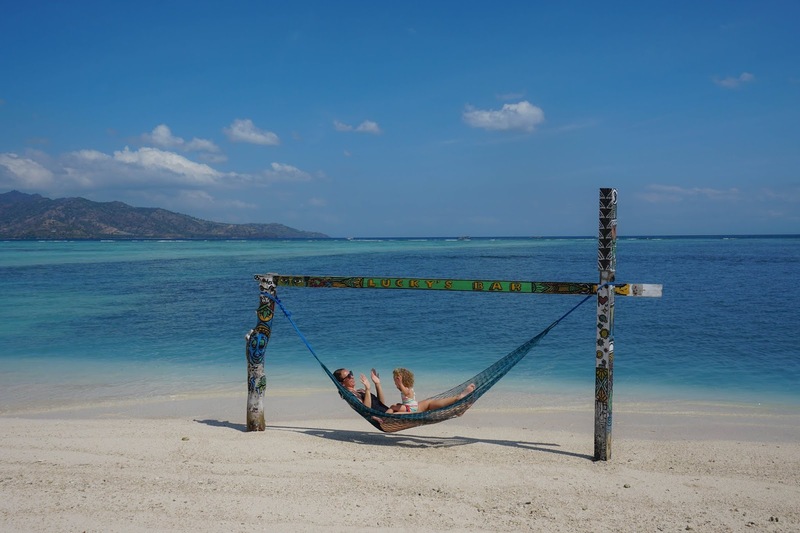 We took a day trip to Gili Air which is an easy 10 minute boat ride. It's beautiful to bike around there. It's much more built up than Meno and there's a lot more people. That meant more dust which wasn't so good for Lilah. We enjoyed the south part of the Island the most. There is a nice wide beach which is good for swimming, many restaurants on the beach, and swings and hammocks on the water. Pacha Mama was a tasty cute little vegan restaurant where we ate for lunch. Lilah is just over two years old. 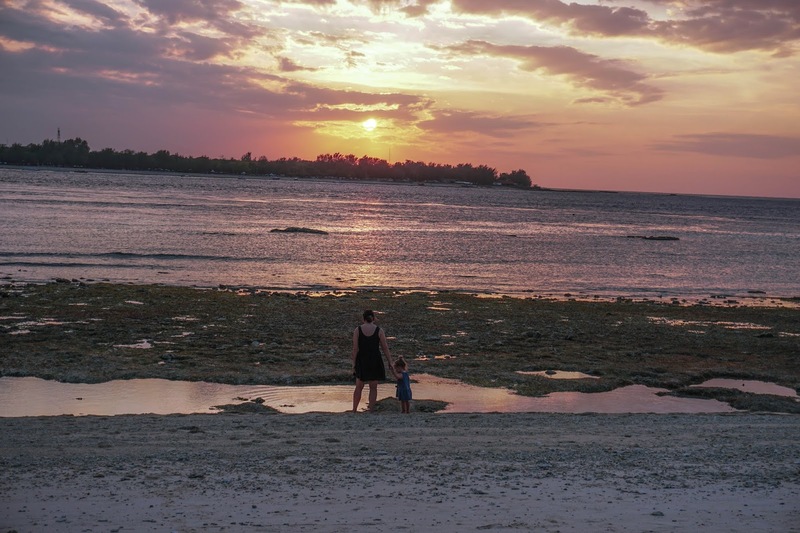 This is why we chose to stay on Gili Meno and we are so happy that we did. It had a very relaxed vibe and we loved biking around the island with her. You can walk around the entire island in one hour so we were never far from home. There were also bikes with a baby seat which we were so happy about. There were many beach front options to eat at with Lilah. We don't often eat out at night but she could play in the sand and we could go and look for fish in the water. The glass bottom boat was perfect for our private snorkelling tour. Lilah could watch the fish swimming beneath the boat and we could take turns going out with a guide. 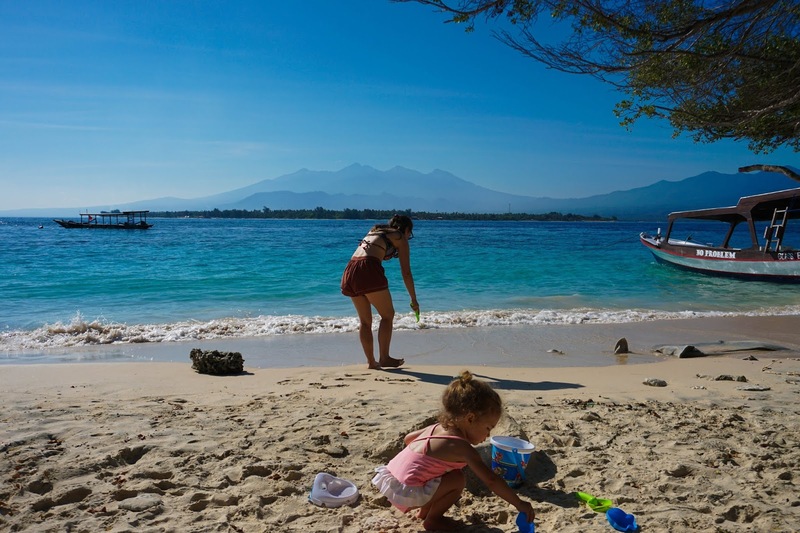 We visited in at the beginning of July and it was quite dusty, especially on Gili Air. The locals said they often get sick this time of the year because it is hot in the day and cooler in the evening. We were fine with the temperature but Lilah got a small cough from the dust. There are small masks you can purchase on the island. There are small supermarkets on the island but we made sure we had enough diapers/wipes and some snacks with us before we went. Sonita always reacts to the jelly fish eggs when swimming in the ocean. Some people call it 'sea lice rash.' She got it bad on her back and legs. Thankfully, Lilah doesn't react the same way. We need to invest in an underwater camera so we can capture awesome moments like swimming with the turtles! Lilah vomited on the way to the Gilis. The water was not very rough but her little tummy must have felt it. It was a good lesson to always be prepared with some sea bands or similar. It was hard to see some of the horses carrying very heavy loads and at times they did not look happy at all!